Homemade cashew chicken packs in vegetables like onions and sweet peppers with lean chicken or tofu and a handful or so of cashews for a healthy dose of vitamins and lean protein. Served with a side of rice and perhaps a green vegetable or salad, you have a quick, affordable, and scrumptious meal on the table within half an hour. Can your local delivery place promise that? Set oven to 350 degrees Fahrenheit. Add cashews to oven-safe pan and leave in warming oven. Remove pan when oven indicates it is preheated. Turn off oven. While cashews toast, heat oil in wok or large skillet. Add diced vegetables. (Broccoli rabe, broccoli, or other ingredients may also be added.) Cook vegetables until soft and then transfer to a bowl. Add a bit more oil to skillet/wok and cook diced chicken or tofu. Add vegetables back to pan. Sprinkle in rice vinegar, stir, and then add soy sauce and hoisin sauce. Taste to check for desired seasoning, adding more sauces if needed. 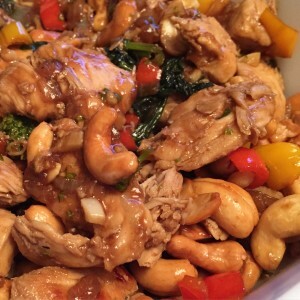 Toss in cashews and coat with sauces. Plate and serve with sides, such as greens and rice. What’s your favorite “restaurant hack” recipe?